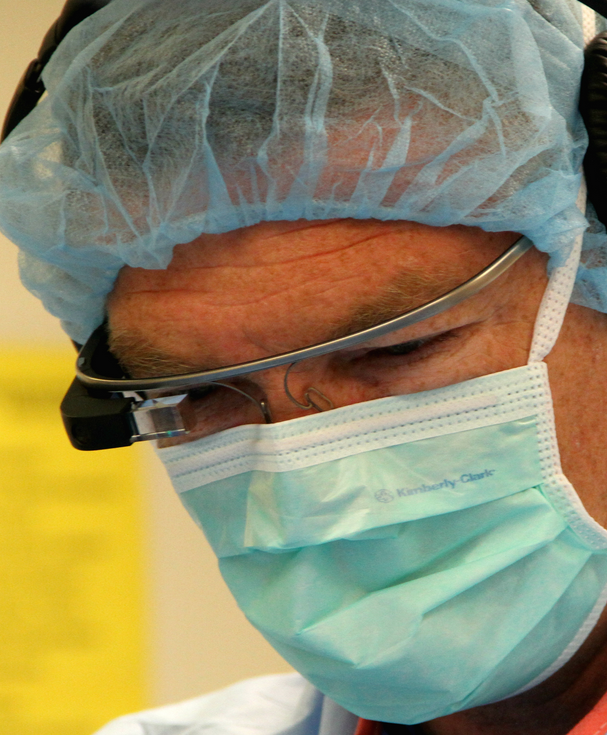 Dr. Christopher Kaeding, a surgeon at The Ohio State University Wexner Medical Center, is the first in the U.S. to consult with a distant colleague using live, point-of-view video from the operating room via Google Glass. Kaeding wore the device as he performed ligament surgery at the medical center’s University East facility. Across town, one of Kaeding’s colleagues, Dr. Robert Magnussen, watched the surgery his office, while on the main campus, several students at The Ohio State University College of Medicine watched on their laptops. Glass could also be a game-changer for the doctor during the surgery itself, according to Dr. Clay Marsh, chief innovation officer at The Ohio State University Wexner Medical Center. “It puts you right there, real time. Not only might you be able to call up any kind of information you need or to get the help you need, but it’s the ability to do it immediately that’s so exciting,” he said. .
Doctors could use voice commands to instantly call up x-ray or MRI images of their patient, pathology reports or reference materials. They could also collaborate live and face-to-face with colleagues via the Internet, anywhere in the world.